Stephen McDonnell hailed the performance of striker Alan O’Sullivan after he helped inspire Warrenpoint Town to three valuable points against Coleraine. The big front man, who was unplayable at times, scored one and won the crucial second half penalty which sealed the win for the hosts. O’Sullivan was a constant thorn in the side of the visitors’ defence and McDonnell was quick to sing his praises after the game. “Alan leads the line ever so well,” he said. “He missed a great opportunity to win the game last week with five minutes to go, but he doesn’t let it effect him, he just keeps battering on. Young defender Robbie Norton showed a cool head to fire Point back in front again from the spot a minute after Darren McCauley had levelled matters at Milltown. McDonnell praised his coolness after revealing that they don’t have a designated penalty taker. “It was a cool penalty, I watched him sprint 60 yards to pick up the ball,” he said. “We have no designated penalty taker, it’s just whoever fancies it. “Robbie has a cool head in fairness to him. He’s that type of character, he takes everything in his stride and doesn’t get too far ahead of himself. Warrenpoint have now picked up points against Linfield, Glenavon and the Bannsiders in recent weeks. And McDonell believes that if his side can start picking up regular points against the teams around them then they can hopefully secure their Premiership safety sooner rather than later. “We should have beaten Dungannon as well, we shaded it in terms of opportunities,” he said. “We have picked up most of our points against the ‘Big Boys’. “I said to the lads if we could look after ourselves in that Mini League at the bottom you could break the top six if we had looked after the first six games. “We’re way off that we just need to keep ourselves focused, get as many points as we can and get ourselves safe as quick as we can. While McDonnell was happy Coleraine boss Rodney McAree was left to bemoan his side’s defending. “We have to stop conceding stupid goals,” he said. “Against Glentoran we let a man go free in four yards of space. Everyone has a job to do and we didn’t do that last week. 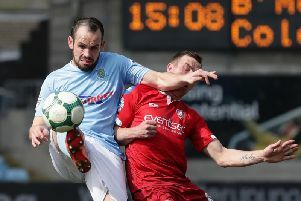 “Today Gareth (McConaghie) tries to head the ball clear when maybe he could have brought the ball down if others had given him more information. “It goes straight to a Warrenpoint player, they break, and the ball ends up in the back of our net. “Then we concede a penalty 40 seconds after equalising. “We need to stop conceding stupid goals first and foremost if we’re going to give ourselves any opportunity. “If everybody chooses the right option we don’t put ourselves under pressure. “Gareth has been excellent, but he knows he had the chance to bring the ball down and play for the first goal. The Coleraine squad was also down to the bare bones as McAree pointed out. “Another big problem today was we only had 11/12 senior players available,” he said. “We have 21 players, three of those are goalkeepers, one is a 17-year-old and one is a 41-year-old. “So that makes things difficult when you have seven players injured,” added the Bannsiders boss.